MU campus has under gone a huge amount of work over the summer, but I don’t care about most of it. What makes me happy are all the newly paved blacktop streets that just got laid down this week. They replaced decades-old oil-and-rock pavement, which is rideable, but far from smooth, and now it’s like riding on glass. Anyway, I took a corner today, hanging a right from Rollins onto Missouri Ave. Right at the intersection was a bunch of tiny glass-like sand crystals covering a freshly painted crosswalk while the paint cures. Fortunately, I had just enough time to lightly tap my brakes, then lean my bike to the left as much as possible, while keeping my body to the right. 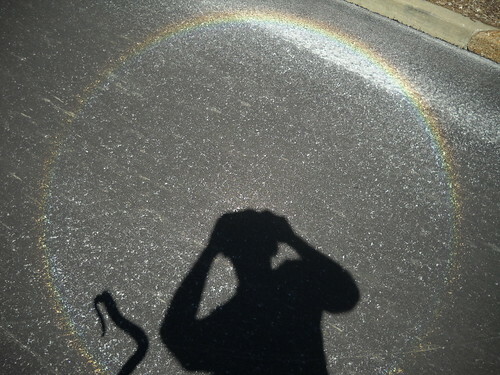 Right as I was thinking how much wiping out on that stuff would have royally sucked, I noticed I was being followed by a huge rainbow halo. The effect faded, but returned further up the block at the next crosswalk, so I finally stopped and took a pic. I guess the sun just had to be in the right spot, and the effect was pretty cool as it followed me up the street with my shadow always in the center. They actually are glass. An old way of making reflective paint was to paint with standard road striping paint, and then toss a shower of glass beads into the still wet paint. I actually had the same experience while running at about 10:30am in Prospect Park in Brooklyn, NY yesterday. They have been doing a lot of roadwork to the running/biking loop, though I didn’t notice any glass crystals. It was really neat though, the rainbow circle stayed ahead of me as I ran with the sun behind me, and it seemed if I just ran fast enough I could catch it and be inside the circle It reappeared to the right of me with the sun on my left as the loop curved through the park…maybe one of the coolest experiences I’ve ever had. We have a nice stretch in town with new blacktop and stripes, so the rainbows follow for about a mile. I’d still rather chase it in Brooklyn than Columbia, MO, though.